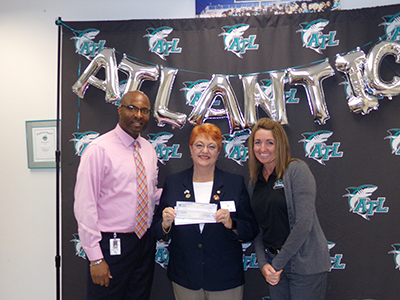 On March 12, Port Orange Elks Lodge #2723 presented $400 to Atlantic High School in Port Orange, Fla., to assist in the after-school/Saturday tutoring program and the senior remediation program which accounts for Atlantic's high graduation rate. These programs encourage students to put forth effort toward their studies for hours on end. Most of these students are receive free or reduced-cost lunches. These programs generally occur outside times in which the cafeteria can provide food, so in those times, snacks, drinks and incentives are provided to the students when possible. The lodge’s donation will be used to purchase these items. This not only fuels their brains but also provides a motivating factor for students to attend regularly. Pictured at the presentation are Stephen Hinson, principal; Linda Lee, Exalted Ruler; and Mrs. Dawn Alves, assistant principal. 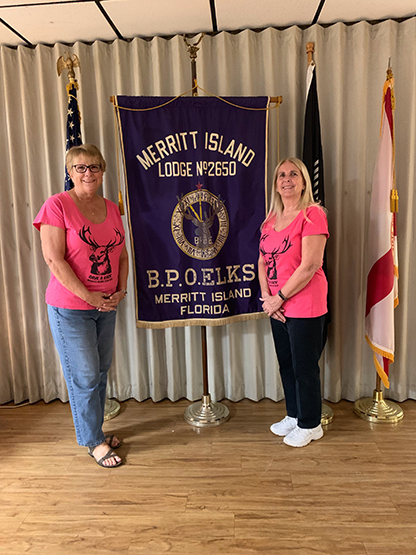 Merritt Island Elks Lodge #2650 has supported Emma Jewel Charter School for the past five years. For parents, children and educators, these schools provide a valuable alternative to the conventional public school system and avoid much of the red tape that comes with it. They allow schools to innovate with new education approaches while largely remaining accountable to the same academic standards to which public schools are held. 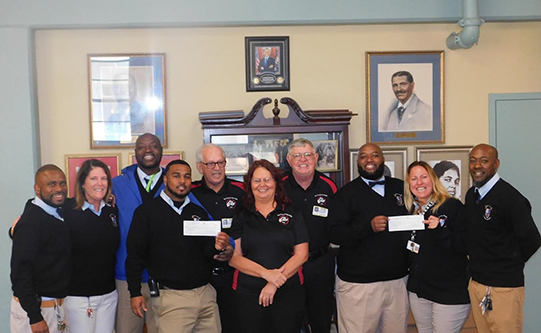 Merritt Island Lodge received an Elks National Foundation Gratitude Grant and Anniversary Grant and then asked the counselors at Emma Jewel what their students needed most. Once again, 35 kids whose parents could not afford them needed new school uniforms. The grant checks were presented to the school administration who then ordered and received the uniforms. 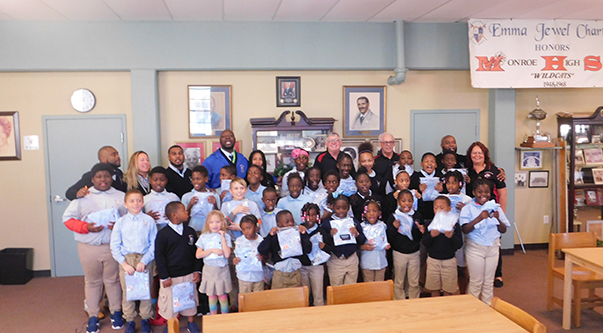 On Jan. 24, Wendy Watters, Kermit Forbes, Robin Gammill and Bill Hazelett Sr. went to the school to hand out new uniforms to the students. They were surprised beyond belief and started jumping and singing! 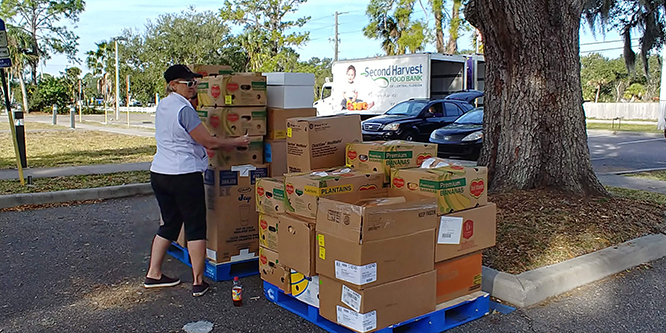 On Jan. 19, Gifts of Love, the local distribution center of Second Harvest for the Edgewater-New Smyrna Beach area, received two truckloads of food. Last year, Second Harvest provided nearly 58 million meals to families, children and seniors in central Florida. Their distribution and community partners make it possible for them to get food to people who need it the most. 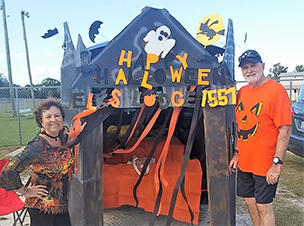 Edgewater-New Smyrna Beach Elks Lodge #1557 is one of these partners with Gifts of Love and many lodge members volunteer on Tuesdays and Thursdays to distribute food to those in need. 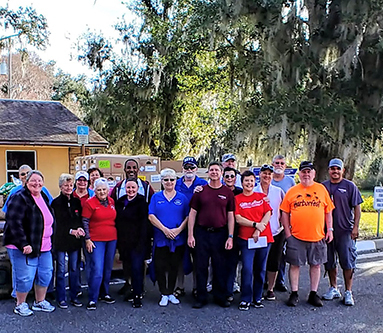 On Jan. 19, lodge members helped unload and distribute this unscheduled food delivery to families of U.S. Coast Guard members located in New Smyrna Beach, Fla., who needed food assistance during the government shutdown. Edgewater-New Smyrna Beach Elk volunteer Barbara Meeks helps open and sort pallets of food for distribution to families of U.S. Coast Guard members during the government shutdown. 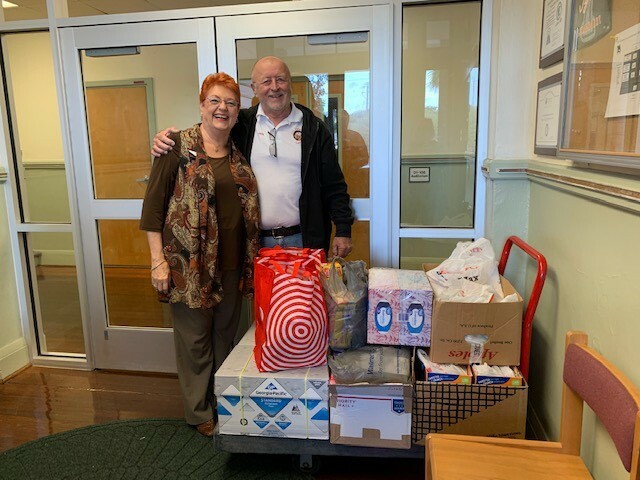 Linda Lee, Exalted Ruler of Port Orange Elks Lodge #2723, and PER Larry Lewis deliver school supplies donated by lodge members to Port Orange Elementary School Jan. 14. Santa’s Boot Strap is a program that provides families with enough food to last them for a week or more. This is the 12th year that Merritt Island Lodge has participated in this event. 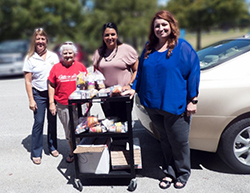 The lodge purchases the food, packages it and delivers it to the families in need. This year, food was provided for 75 families totaling 302 people. 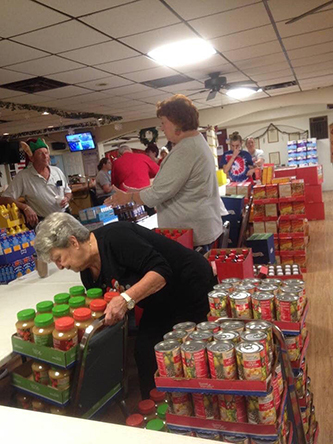 Lodge Chairman, Marleen Kovalchik, organized this function with the help of numerous volunteers including the lodge Antlers youth group. On Dec. 9, Merritt Island Lodge helped sponsor the country Christmas party at Kiwanis Island Park on Merritt Island. For two decades, the lodge has supplied all the food, drinks and desserts for this party. As he has for many years, PDD John Lesko helped organize the lodge’s participation in this event. This party is for all people in the community who are disabled. The Elk Cowpokes hauled supplies to and from the party, set up, cooked, served and cleaned up. 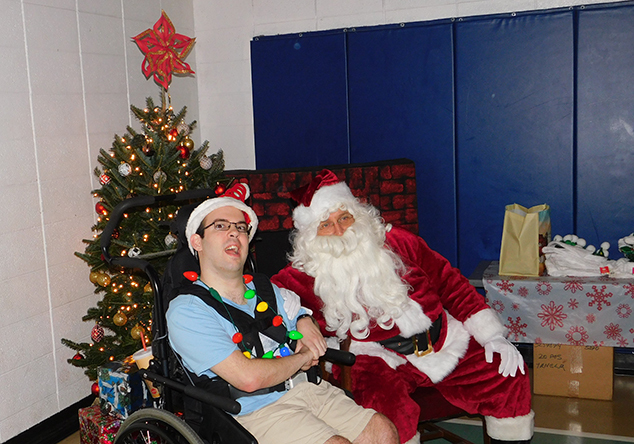 Santa made an appearance and gave the guests a Christmas party to remember. 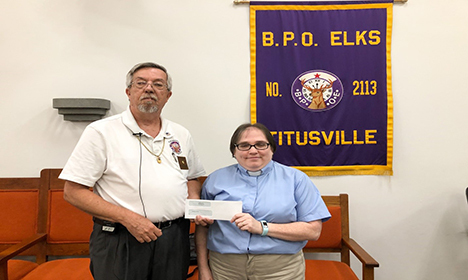 Titusville Elks Lodge #2113 donated a portion of their Elks National Foundation Gratitude Grant to Growing in Grace Ministries. This organization offers tutoring and food help to kids and families with special needs. This organization also stocks a food pantry at a new school, Legacy Academy Charter School. The grant funds will be used to stock the tutoring office with therapy items and supplies and food pantries at the ministry office and at Legacy School. Titusville Lodge Exalted Ruler, Wayne Becraft, presents a donation to Reverend Heather Heineman, founder of Growing in Grace Ministries. On Oct. 28, the Merritt Island Elks Lodge #2650 team participated in the Making Strides Against Breast Cancer walk. This is an annual event that the lodge has participated in for the past seven years. This year the event was held at The Avenue in Viera, Fla. The team raised $2,560. Pictured are the two team members, June Horgan and Elaine Marr. On Nov. 10, DeLand Lodge sponsored a hoop shoot at DeLand Middle School. Children from schools all over Volusia County participated in this annual event. The first-place winners from the three age groups for both boys and girls moved on to the district Hoop Shoot held Jan. 5 at DeLand Middle School. 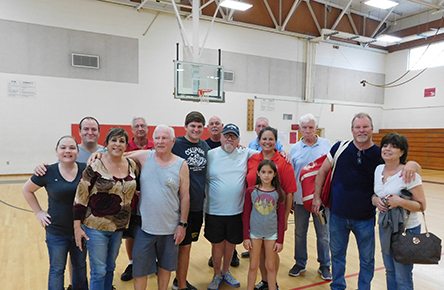 Volunteering at DeLand Lodge’s Hoop Shoot held at DeLand Middle School Nov. 10 are (front row) Katherine and Ken Conroy, Linda Witt, Dan Dragonetti, Troy Surloff, Van Johnson, Davina Jones with daughter Sara Jones, Mark & Barbara Thompson. In the back row are Larry Smith, Phil Watercutter, (third person’s name missing) and Bernie Korwes. DeLand Elks Lodge #1463 has donated the use of their lodge for the training and adoption process for New Horizons Service Dogs. New Horizons provides service dogs to disabled adults, children and veterans at no cost to the recipients. The dogs have had approximately two years of training before being paired, and each recipient must complete the two-week training and process.